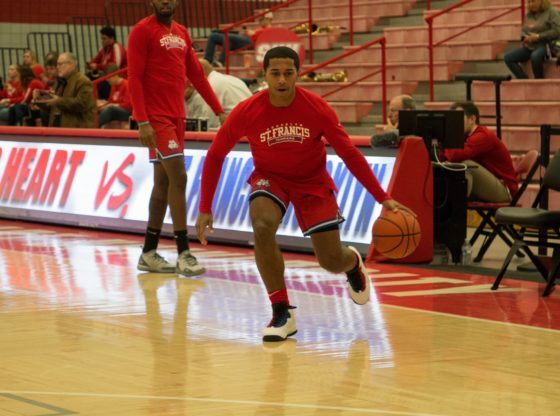 The St. Francis Brooklyn Men’s basketball team (13-10, 5-5 NEC) went down in a 62-71 loss to Sacred Heart (10-13, 6-4 NEC) on Saturday at William H. Pitt Health and Recreation Center. Sacred Heart forward E.J. Anosike scored a career high 27 points, while Aaron Clarke scored 10 points in being the only players to score in double figures for the Pioneers. The Terriers looked dominant in the first half in being up 20-9 with 7:30 to go in the first half. They also held onto a 32-26 lead into halftime, holding the Pioneers to 29 percent shooting. Though the Pioneers came out surging in the second half, shooting 46 percent from the field while also shooting 50 percent shooting from beyond the arc. Chauncey Hawkins came off the bench with energy for St. Francis Brooklyn to scoring 18 points, while Yarada Evans was sensational on the boards in coming down with 15 rebounds. St. Francis Brooklyn has now split their season series with the Pioneers after they won against them in their first meeting on January 19 at Pope Physical Education Center. St. Francis Brooklyn was up 28-14 with 3:46 left in the first half. However, Koreem Ozier hit two 3’s while Anosike scored another as the Pioneers went on a 9-0 run to pull within 32-26 at halftime. The Pioneers were only down by two when Aaron Clarke shot a 3 at 13:09 followed by 3 pointers from Kinnon LaRose and Anosike to give the Pioneers an 11-0 spurt that would give them the lead for good.